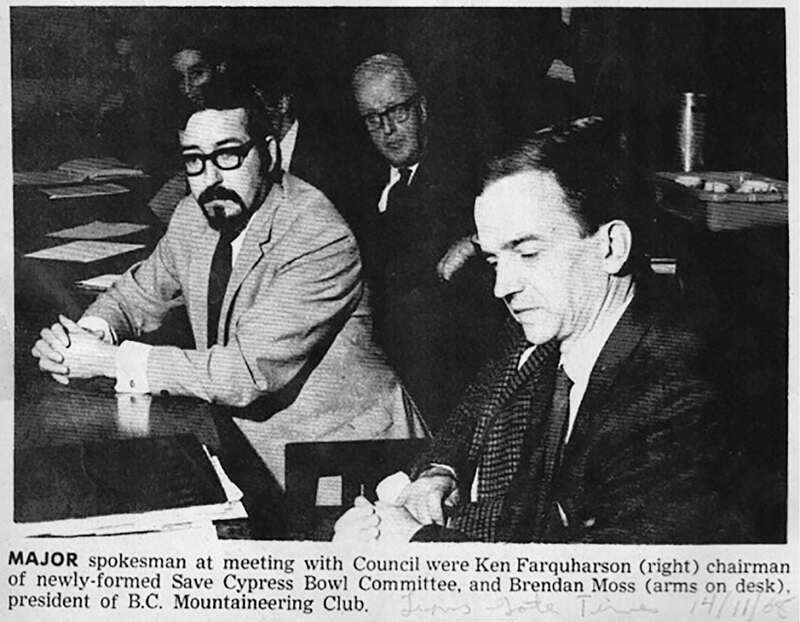 Sierra Club BC member Ken Farquharson has been with us from the very beginning. Ken got involved in working to defend Cypress Bowl and the Skagit Valley from development in the 1960s. He was part of the successful effort to include the West Coast Trail in Pacific Rim National Park. In 1969, he helped co-found the Sierra Club of BC. Manager of Donor Engagement Elisabeth Hazell sat down with Ken to listen to some of these stories. The transcript is below. Ken now lives in Metchosin, a suburb of Victoria on Vancouver Island. Elisabeth: How did you get involved with Sierra Club BC? Ken: Well, I came to BC first in 1959 because I very much enjoy the outdoors. I’d grown up in East Africa and had enjoyed the coast and some of the backcountry of East Africa, and the wildlife. When I was at school in Scotland, I hiked the hills, I was very much for the outdoors. And BC offered me something larger scale, something broader, more interesting, which is what brought me here. When I first saw the forest on the coast, I was living in Vancouver; I was just astounded at their majesty. And in 1965, I was living in West Vancouver and the proposal came forward have a private ski development in the Cypress Bowl. And as we watched what was happening it was clear the logging plans did not match what had been agreed by the municipality and the province. So we started the protest against the developer at that time…. So that was my first introduction to arguments over resources in relation to the environment. And that experience made me wonder and it made me question decisions that are being made by government. Ken working on the Cypress Bowl issue in 1968. And then in 1968, a friend of mine told me of the notice that had been given to cabin holders in the Skagit saying they were about to be displaced because of this deal that had been made between the province and the city of Seattle. So at that time we got hold of the agreement that had been made and it was so one-sided, that we felt we had to take a run against this. Many of us, I was with the BC mountaineering club at that time, we knew the Skagit well, we’d go in there, we enjoyed the peaks in the country around there. So, in 1968, we took another run at the government. And if you told me then it would take until 1983, to resolve it…(laughs). I’m not sure I would have been so eager to start. However, eventually, the government conceded that the deal was crazy and the settlement was made with Seattle. So those two experiences really began to make me think that we needed a conservation organization in BC that was prepared to be much more aggressive. We’d had environmental organizations here who were very gentlemanly in their dealing with provincial government, they tended to be senior academics and others and they would go to cabinet ministers, make a nice presentation about the environment in particular areas, desirability of a park and so forth, but they were never prepared to challenge. This is the time when the Sierra Club was having very strong challenges to US decisions on the Colorado forestry, in Washington and Oregon and other places so they were also people living in Vancouver such as Jim [Bowman? ], Terry Simmons, and others who were from the US. Who are very familiar with the Sierra Club structure and who had joined into the arguments over the Skagit. So bringing all those pieces together, we decided to set up a Chapter of the Sierra Club in BC. So that was the history. Elisabeth: Are any of those folks still around? Ken: Terry Simmons is around. Bill Darnell was another. I believe he lives in Kelowna. Terry is connected with SFU, I don’t know whether he’s still got any direct connections in it or not. Jim Bowman is dead. Katy Madsen was another, but she’s now passed. 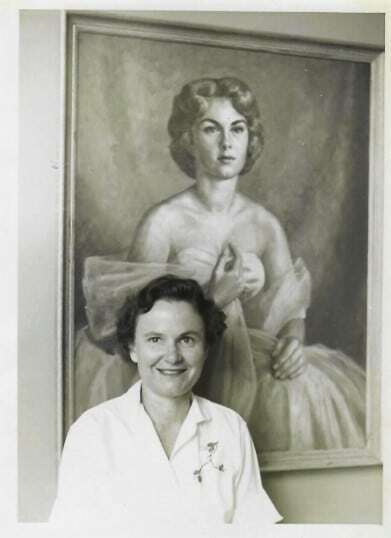 Katy Madsen, another co-founder of Sierra Club BC. Elisabeth: Yes. We just did an event with her art. So her family is still involved. So what are your hopes today for the province of BC? Ken: I think BC is an incredible place in that outside maybe the Communist world where there’s no hardly a place in this world where the crown holds such a variety of resources: from forestry, minerals, scenery, recreation capability, fish, wildlife, all these things. I still think that the management of those resources is absolutely the most important thing that our provincial government could do and to manage these for generations for the future. And so it has been great sadness to me to see the downgrading of this environment, the forest service, the arch branch, all the elements with increasing the element of privatization. In particular, I am aghast at the onset that logging companies can hire their own environmental consultants, put their own stamp on it and say, “That’s just fine.” To my mind that has gone way beyond what is acceptable in terms of responsibility. In fact I’d classify it as irresponsible management. Elisabeth: So you would hope that we find a way to manage our resources more sustainably. Ken: Yes. That is a prime objective. Then secondly, you come into the urban sections. And are we working effectively in our urban and in our suburban areas? Are we going to black tar the Fraser Valley from the sea to Hope? So there are oceans and then finally, you have the issues that I spent a lot of my life working on which is hydroelectricity. And I think we have slipped very badly in specifically our electricity policy in this province. I’d like to see us already making the transition to renewables other than hydro because the impacts of large hydro are incredibly destructive as we’ve seen with Mica, Arrow, the Peace and now with Site C. And I cannot understand given the enormous batteries that we have in these huge hydro plants why we cannot be adjusting so that these now provide the backup to the solar, the wind and the other renewable elements. I do not see that we have to build any more on that sort of scale. Having said that, I should explain to you I worked on the Arrow Dam. I worked at the Mica Dam. So I know them well. Elisabeth: So it’s not just conjecture, you’ve got direct experience. Elisabeth: So for someone else who might be considering making a bequest to Sierra Club BC, why would you recommend us as an organization to invest their legacy in? Ken: I think first of all, the club has now been able to show that it has been able to achieve continuity. I think 50 years is a significant time. And it has not done that focusing solely on one person or one spokesman, there have been transitions to show that it has lasting continuity in terms of its management. Secondly, I think that they are prepared to invest in more than just rhetoric in that with people like Jens and others they’re putting a certain degree of science into the background arguments. And I think that is key particularly when government is no longer providing or even attempting to provide that sort of science. So those are my two main arguments. And then thirdly, I would argue that as we’re actually closely associated with the west and there’s many of our issues such as the Columbia Treaty, energy transfer across borders, forestry across borders that there is strength still in having the link with the US in terms of achieving results. I’m not sure it has helped us in forestry but the time may come. Elisabeth: Do you have anything you think you’d like to add as a sort of message to our supporters? Ken: Well, I think there is one thing and that is that the club as I see it today, remember, I went back to Bretton from ’85 to ’96, which is a time of quite a lot of changes in the Sierra Club locally because when I left in ’85 we were largely based in Vancouver, the main center of activity was. The time I came back, the main center of activity had switched to the Island. But there are some advantages in that, there are some losses in that, but I think what the club has done is to keep its focus on a certain number of projects at one time and not get too scattered. And I think that’s important too. I think to be successful you have to keep that focus and devote what resources you have to getting the results. 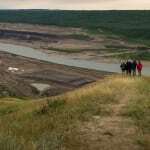 I mean it’s Site C at this point, story not over, but it’s been a heartache. But I can remember, it must be four years ago listening to Caitlyn Vernon at Cattle Point talking about Kinder Morgan. So the work continues. Elisabeth: Yes, we’re fortunate we have some really exceptional and talented individuals working for the club right now. Environmental Educator Kirsten Dallimore looks out over the Peace Valley near the proposed Site C dam site. Ken: And you have to remember, all the important transition in ’85 when I left. There was no paid employee. I guess all the club records were erased. So there were just some file boxes left under somebody’s desk. And we scurried around to see if there was enough money to pay for someone to talk to a minister. It was a completely different scale of operation and to see it now where I don’t know what the total paid staff is but I’m sure it’s over 12. Elisabeth: I think it’s closer to 15 at this point. Ken: I mean it’s astounding because, yes, some have to be involved in the fundraising side such as yourself, and I appreciate that but it does mean that there are people who are focused. I mean, I was a conservationist while trying to earn a living and some of these arguments with the government over the Skagit were not exactly in my employers’ best interest. Remember, BC Hydro is what I worked for. Elisabeth: Thank you for being so committed. It’s because we’ve had a number of people who have stayed with us through this long period of time that we are where we are today with over 1500 members and with over 35,000 people who we can call upon to write and call and mobilize when there’s an issue that we need to talk about publicly and we’re growing. So that’s exciting and positive. Have you considered leaving a bequest to Sierra Club BC? It can be as simple as adding a sentence to your will. Find out more at sierraclub.bc.ca/legacy-giving.